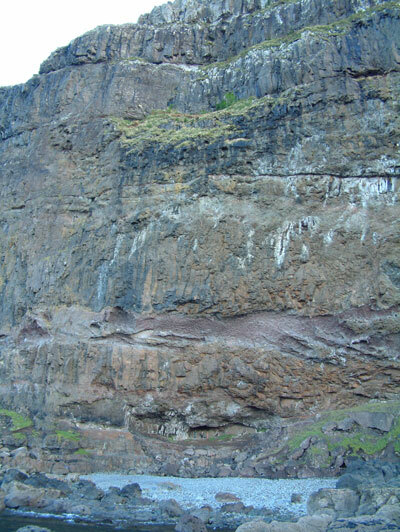 The rock shelter and midden known as Uamh an Eich Bhric, or Cave of the Speckled Horses, lies below west-facing sea cliffs some 3 kilometres south-west of the village of Fiskavaig and some 400 metres south of Geodh’ an Eich Bhric. 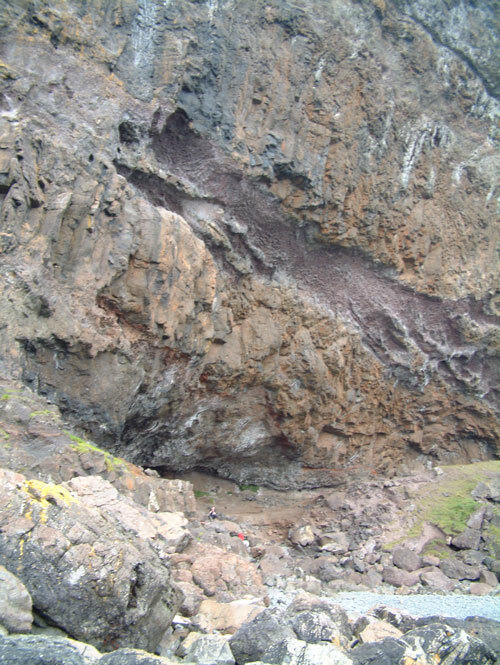 The cliffs at this point are around 110 metres high and are composed of basalt lava’s, laid down over several successive volcanic events during the Tertiary Period between 60 and 50 million years ago. Access to the site by land is difficult and involves a 90 minute walk across wet undulating moorland, followed by a steep descent down a 100 metres high grass slope. 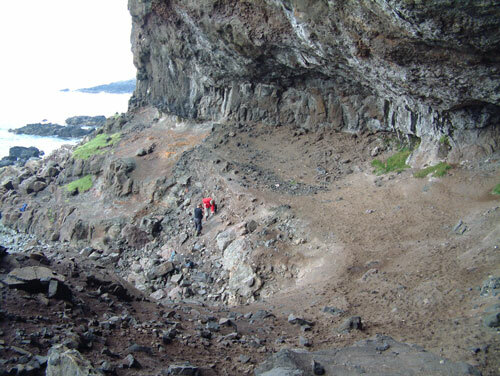 This leads down to the boulder shore, where a 400 metres scramble along the high tide mark leads to the rock shelter. The alternative to the walk out to site would involve a rather hazardous landing by boat on the rock-strewn and pebble beach, which is only accessible during the high tide. Waterfalls cascade from the cliff-tops to the beach on both sides of the rock shelter, creating a dynamic setting for the site. 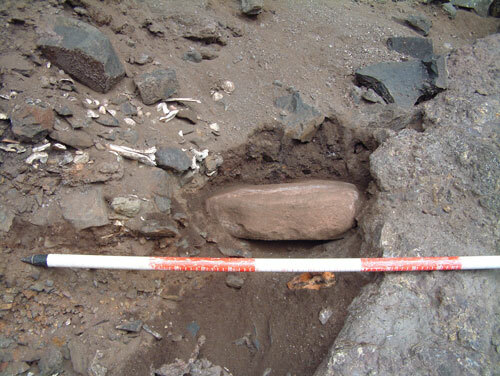 In the later summer of 2006 Mr. Rod Richard of Strathpeffer informed John Phillips (Highland Council Ranger for Skye & Lochalsh) that he had seen bones exposed in a steep sediment and boulder bank at the base of the cliffs, while walking on the shore near Fiskavaig. John Phillips in turn passed on these details to Martin Wildgoose of Archaeological and Ancient Landscape Survey and along with Steven Birch and George Kozikowski, visited the site in October 2006. 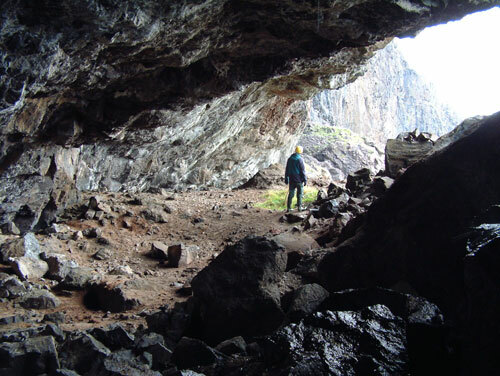 Our first impressions were of a massive midden within the rock shelter, in an incredible location in the landscape, on the limits of land and sea. The visible remains comprised a sea-washed section of what was once the fill of a large rock shelter located just above the High Water Spring Tide level. 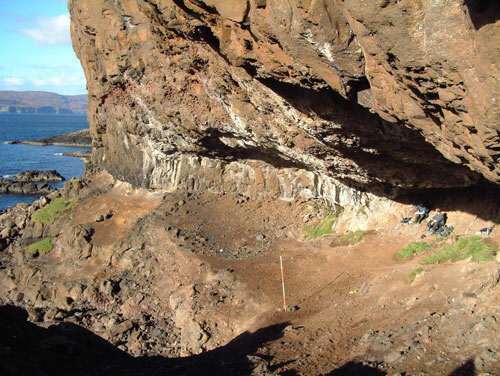 The eroding section within the shelter measured 30 metres long by 3 metres high and visible in the face of this section, under more than a metre of accumulated roof collapse, was a layer of cultural deposits averaging between 0.4m and 0.6m thick. 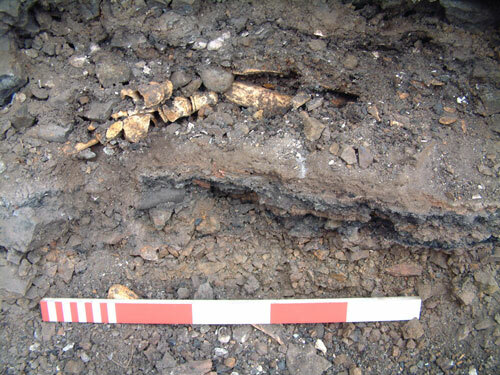 This cultural layer contains well-preserved animal bone, fish bone, shellfish, heat-cracked pebbles, charcoal, ash deposits and other organic residues. 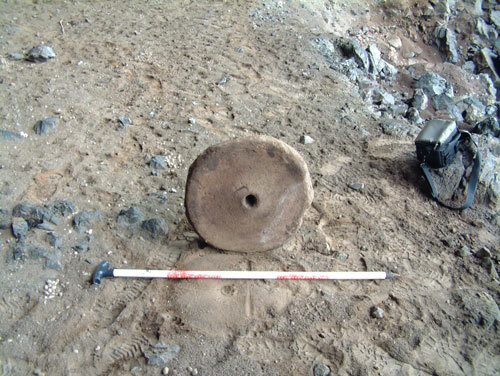 A closer inspection of the eroding section and the debris at its base, revealed pebble tools, several pottery sherds, bone tools, fragments of bronze (copper-alloy) and the complete upper stone of a rotary quern manufactured from Torridonian Sandstone. 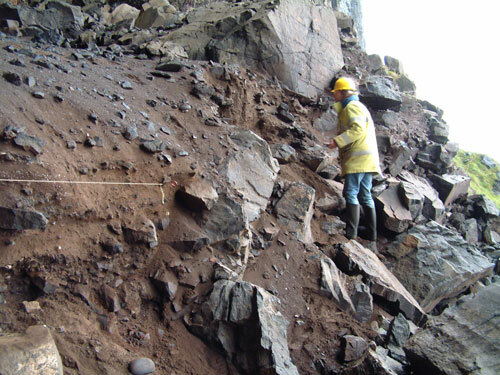 Distinct activity areas could also be recognised within the eroding face showing discete depsotional events; areas containing material potentially related to copper-alloy smelting or smithing, limpet and fish bone middens, and dumps of ash. Storm action had already eroded at least 4 metres of the midden face at the south end of the site, with between 1 and 2 metres removed at the north end, while debris from the collpased section lay across several metres of the foreshore along the entire length of the midden face. 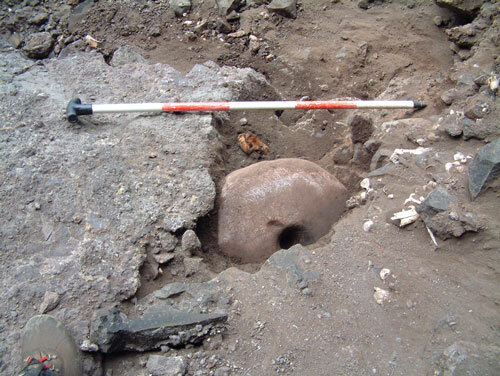 During this first visit to the site the exposed and eroded cultural deposits, including the quern stone, were removed as the next big storm would sweep them away. Several visits have now been made to the site. During the second visit, a series of base-line erosion markers were established so that we could monitor the loss of material from the site through time. A plan was also made of the rock shelter and associated features and profiles recorded through the site, while detailed section drawings have also been made of the eroding midden face. Photographic and video records have also been taken during the visits to site, while the inspection of the eroding midden face has produced a steady stream of small finds. We knew from previous monitoring trips that the site suffered from increased erosion rates due to the combination of winter storms and high tides. Therefore, during a trip to the site in October 2007 we recovered samples from three vertical columns in the eroding face of the midden. By carrying out this task, we knew that we could at least salvage important deposits from the site before they were lost to the sea. 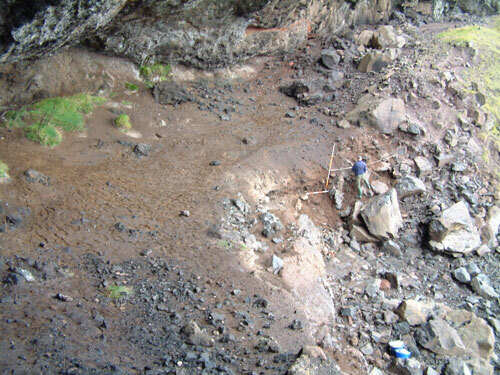 Extracting the samples also allowed us to make a more detailed assessment of the midden, especially when combined with the detailed recording of the eroding section. In particular, this exercise allowed us to recover a large amount of animal bone from the midden, much of which appeared to be from cattle and sheep-goat, although we did find some bone from red deer and pig. All parts of individual animals appear to be represented including cranial fragments and teeth, and bones from the extremities such as hooves and lower limb bones. We also noticed that some of the bone appeared to be semi-articulated, almost as if animal carcasses had been deposited in the midden. During the removal of the samples of animal bone we also identified some clusters of hatched fly pupae cases, which were embedded between the layers of bone. 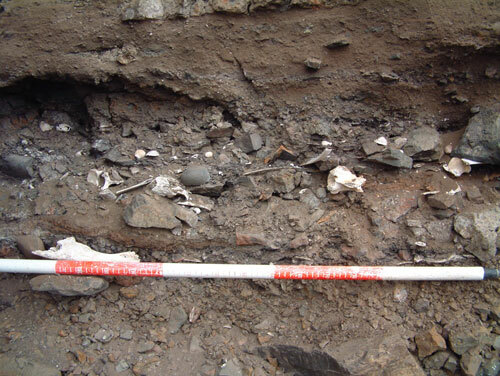 This suggests that the deposition of the bone midden was over a limited time range, some time between 50AD and 240AD. 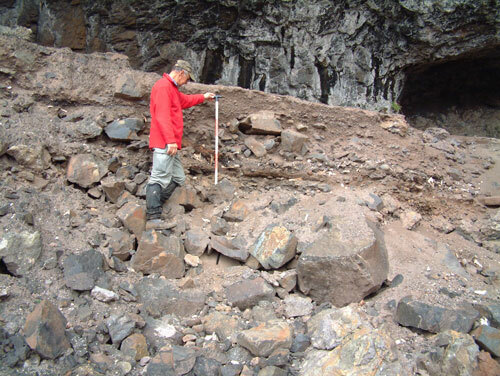 The dates place the use of the site during the middle Iron Age, while the dates are similar to those obtained during the excavation of Dun Ardtreck by Euan MacKie. Dun Adtreck is located around 4.5km to the northeast of the rock shelter at Fiskavaig, in Loch Bracadale. Excavated between 1964 and 1965, the earliest date for the construction of the dun came out at 2005+/-105BP, but the occupation of the site continued for at least 400 years after this. 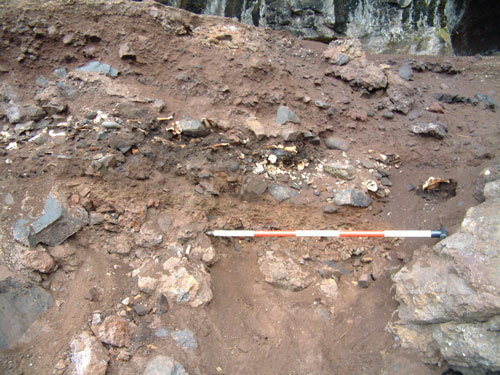 The excavation produced quite a range of Roman items, especially for an Iron Age site situated on the Scottish west coast. 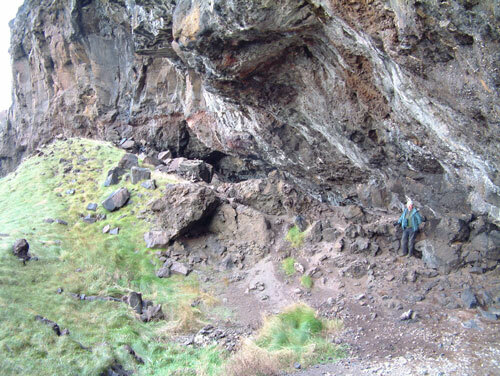 A second rock shelter is located around 400 metres to the north of Uamh an Eich Bhric, which has not been subjected to the erosive forces seen at the latter site. 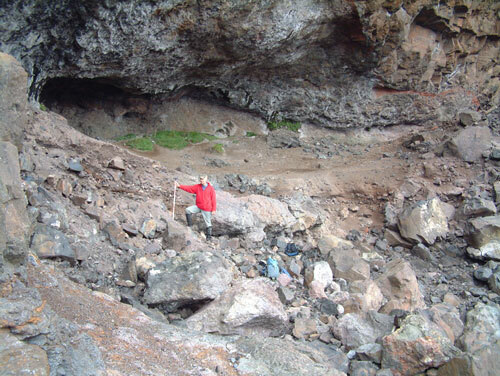 No midden is visible within this shelter, but its form and morphology allows us the opportunity to see what the Cave of the Speckled Horses probably looked like before it was breached and partially destroyed by the storms in January 2005. 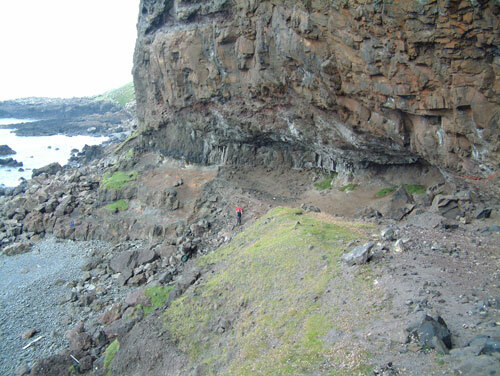 The Cave of the Speckled Horses is located in a very unusual location at the foot of the west-facing cliffs near Fiskavaig. Seclusion was apparently more important than ease of access and the function of the site at present remains a mystery.....However, we now have a unique opportunity to unravel the story of the site and place it in its wider landscape setting. Excavations will commence at the site on Monday 14th April, so visit the ‘News Page’ again soon for regular updates on our progress. I add your interesting blog in my iGoogle page! A diagram of the inhabited area in relation to the grassy slope and the sea would be of interest.Has the sea level altered much and if so how recently? Any dating yet? What an amazing place - will you be excavating there at all this year or perhaps visiting the site at all???? Am planning dates hoping to be there July’ish!